I have been for the past few years very interested in my family history and Francis Marion Cockrell has definitely been a focal point. I’ve since located his C.S.A soldier records, newspaper articles, books, etc that have given me a lot of information regarding his involvement in the war. I am very interested in continuing a discussion of him, or even the battle in general in which I have taken a great interest. Please don’t hesitate to contact me with any questions or comments, I’d love to hear from you. Thank you. Wounded at Franklin? : Yes, in both ankles and the right arm. His unit was one of the first to encounter the union position. Survive Franklin? 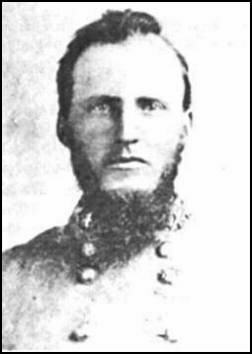 : Yes, to rejoin after recovery to rejoin army before being captured at Fort Blakely, AL in April 1865 effectively ending his service in the C.S.A. Exact Relation: He was my great great grandfather by direct relation. Pictures: There are several pictures available by google search and in several books on the First Missouri Brigade. I can attempt to scan images in desired. Surviving letters? : Only personal letters from later in his life. I have yet to find anything at my grandfathers in his hand about his war experience. I did happen upon an article in a newspaper my grandfather had where he had been interviewed about his war experiences. If I can get a scanned copy I can share it. Permission granted to share any information that will enrich the historian’s understanding of both my relation and the War. This entry was posted in 1st Missouri Infantry, Cockrell's Brigade, Direct descendant, Franklin casualty, Photo exists of soldier, Survived Franklin, Survived the war. Bookmark the permalink. I am the Commander of the BG Francis Marion Cockrell Chapter 84 in Missouri. I would like to hear from any relatives of the General. My email is confedman@gmail.com.